Someone remarked to me the other day that to call the ubiquitous device that is never far from our hands a "smartphone" is a bit of a misnomer, given that we mostly use it for every purpose other than telephony. We use it to surf the Internet, stream movies and music, text, e-mail, do business, take pictures and so forth. And only rarely, it seems, do we talk on it. In the same way, to refer to the latest Smart Nation offering as "smart lamp post" makes it sound as though it is merely a street lamp with a camera tacked on to it. Given its powerful and far-reaching surveillance capabilities, it does rather a lot more than that. Technology is central to Singapore's Smart Nation project. It is true there are other crucial aspects of realising the Smart Nation vision, such as transforming society's prevailing mindset, culture, processes, structures and so forth. But really, it is the technology that stands out if for no other reason than it is tangible, visible, and frankly, impressive. 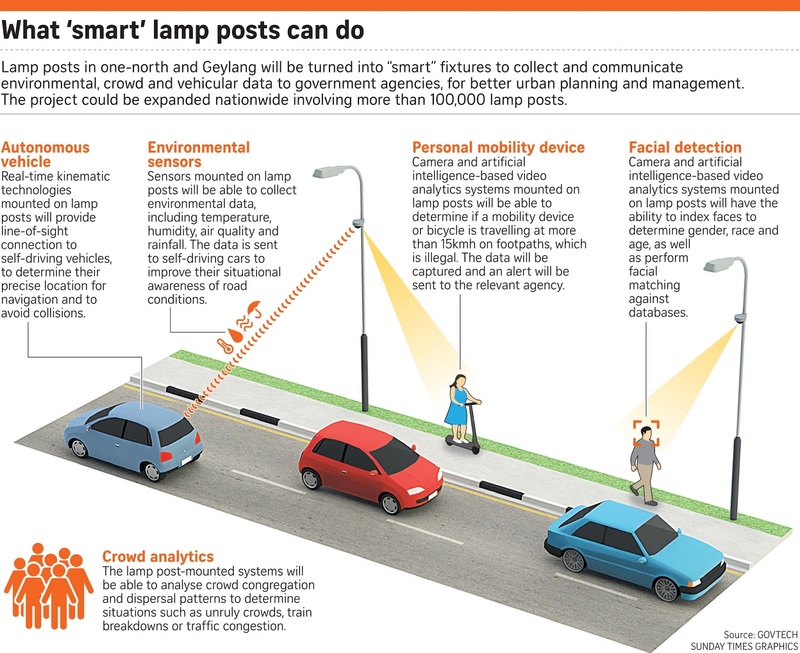 The smart lamp post, an integral part of the Smart Nation Sensor Platform, has come across as more shock than awe because of its ability to give the Government the ability to obtain highly granular information about people, based on geospatial mapping, facial recognition and artificial intelligence capabilities mapped onto Singapore's ubiquitous national identity card system. A person's identity, location, race, gender, age, and even behaviour, can be pinpointed. Predictably, there have been adverse reactions stemming mainly from privacy concerns and how such information might be abused or compromised. Apart from privacy intrusions, surveillance technologies give rise to even more insidious applications: the ability to discipline and punish. English philosopher Jeremy Bentham's 18th century idea of the "panopticon" - a single tower in a prison yard that enables the prison warden to monitor prisoners - is particularly apt, given how it is evocative of the all-seeing smart lamp post. The panopticon works on the principle that while the prison guard can see what all the prisoners are doing, the prisoners cannot see what the prison guard is doing. Because of this asymmetry, the prisoners cannot know if they are being watched, and therefore behave in the desired way just in case they are being watched. Replace "panopticon" with "surveillance technology" and "situational awareness", and the similarities become uncomfortably stark. The network and surveillance technologies that underlie the Smart Nation's smart lamp post, and other similar initiatives elsewhere, constitute a double-edged sword. The same technologies that empower citizens and improve their lives are also the same technologies that allow governments to monitor and manage behaviour (either via "nudges" or more forceful manoeuvres), and to punish deviation from the desired behaviour. So while such technologies can improve the provision of public services - the pre-eminent of which being security - they also go beyond that to shape behaviour, nudging citizens to behave this way or that. Such technologies now determine, to a large extent, how societies are governed. It is generally held that societies are governed based on laws, rules, norms, and standard operating procedures. It is actually more accurate to say that societies are governed based on the threat and meting out of punishment of deviations from those rules and norms. Such technologies will not only allow governments to punish transgressions, but also to even pre-empt them. Indeed, Michel Foucault used the concept of disciplinary power to explain how the anticipation of control and punishment causes people to engage in self-surveillance, which then results in them behaving in the manner desired by authority in the first place. Today, many diverse technologies permeating the various networks in which we live, manifest the increasingly pervasive power to discipline and punish. 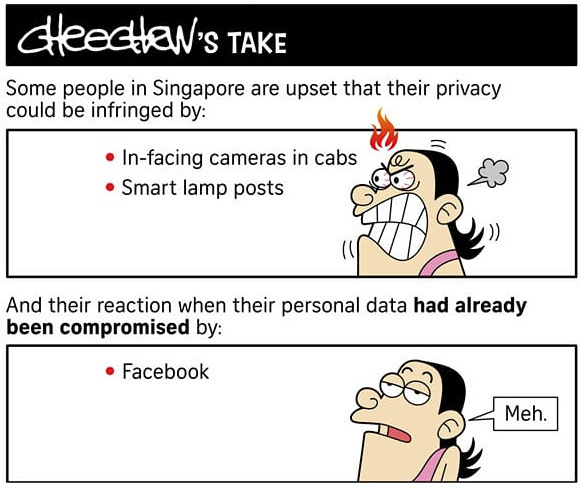 In other words, what Singapore as a society should be concerned with, is not simply the technological capabilities of the smart lamp post, but what it symbolises: the perpetual gaze of authority on the people. Aside from the obvious privacy dimension, living under the constant gaze of the government may have consequences for a society's psyche. Take innovation, for example. Imagine a society trying to break away from its deeply-entrenched risk averse and hierarchical culture. Such surveillance technologies, and the implicit power to discipline and punish, can scuttle efforts at innovation, which are inherently risky and involve testing rules and boundaries. The anticipation of surveillance by authority could result in self-surveillance, self-monitoring, self-censorship, and a growing reluctance to improvise, innovate and take risks; in short, to deviate from the rules. The challenge for societies will be to balance the security imperative on the one hand, while mitigating the potentially suffocating psychological effects of living under the panopticon's gaze on the other. If we uncritically privilege the security and order that surveillance power can bring about, without appreciating the broader and unanticipated consequences, we could risk choking off the serendipity and messiness in which innovation and improvisation thrive. Adrian W. J. Kuah is senior research fellow at the Lee Kuan Yew School of Public Policy. Plans have kicked in to fit lamp posts with sensors and cameras that can collect a wide range of data, which can be used to direct driverless cars, catch speeding e-scooters and even analyse faces, down to race, gender and age. With the information, government agencies can increase their situational awareness, detect potential problems and respond quickly to incidents, such as unruly crowds, train breakdowns or traffic congestion. Details of these plans were released last week at a private meeting between GovTech, the agency behind this project, and interested contractors. Prime Minister Lee Hsien Loong had briefly mentioned the plans in his National Day Rally speech last August. According to tender documents, street lamps in one-north business park in Buona Vista and Geylang will be the first to be "smartened up" with state-of-the-art fittings. They include temperature and rainfall sensors, surveillance cameras and artificial intelligence-based video analytic systems, which allow for facial matching against a database. Real-time kinematic technology equipment will also be mounted to provide line-of-sight connection to self-driving vehicles to determine their precise locations for navigation and to avoid collisions. This network of interconnected smart lamp posts, with the data transmitted either wirelessly or via fibre broadband, is collectively known as the Smart Nation Sensor Platform. GovTech told The Sunday Times that the trial is scheduled to start early next year after the equipment is installed. The project may eventually involve more than 100,000 lamp posts nationwide. "The trial aims to assess how we can make use of existing public infrastructure such as lamp posts to fit, connect and power various kinds of sensors that can help us improve the living environment," a GovTech spokesman said. "GovTech will draw lessons and insights from the trial before deciding on plans to scale up implementation." Singapore has a network of security cameras, but this plan takes it up several notches because of the use of more sophisticated technologies that can merge data sets and draw detailed analyses. By looking at crowd distribution heat maps and the crowd behaviour and mix, the authorities will be better able to manage crowds. The sensors can also detect, classify and record objects such as backpacks, personal mobility devices (PMDs), bicycles, and car models and licence plate numbers. For instance, if a PMD or bicycle is travelling at more than 15kmh on footpaths, which is illegal, the data will be captured and an alert sent to the relevant agency. 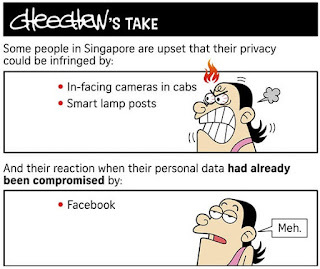 While Singaporeans and experts whom The Sunday Times spoke to generally welcomed the plan, some raised concerns about privacy issues. Sales manager Faith Heng, 39, said: "While people may appreciate the presence of such technologies during emergencies and when a crime has taken place, they will also worry about the intrusiveness of such surveillance." Smart street lamps will be lighting up Geylang and one-north business park in Buona Vista early next year, now that ST Engineering has won the tender for the Lamppost-as-a-Platform project. The local conglomerate won the $7.5 million tender to fit lamp posts here with sensors and cameras that can collect a wide range of citizen surveillance data. ST Engineering edged out five other contenders - including local telco M1 and multinational tech firms Accenture and NEC - to win the tender, The Straits Times has learnt. With the surveillance information, government agencies can increase their situational awareness, detect potential problems and respond quickly to incidents, such as unruly crowds, train breakdowns and traffic congestion. The details of this tender were first reported by The Sunday Times on April 8. Prime Minister Lee Hsien Loong also mentioned the plans in his National Day Rally speech in August last year. A spokesman for GovTech, which called for the tender and is the central agency behind public sector tech transformation, said ST Engineering was picked as it has overseas partners and the in-house capabilities to provide what is necessary. These include end-to-end solutions for sensors and inter-operable video analytics. Mr Ravinder Singh, president of electronics at ST Engineering, said: "We will bring our experience from our global deployments of smart street lighting, water and energy management systems to work with GovTech." More than 100,000 lamp posts nationwide may eventually be "smartened up" after the trial in Geylang and one-north. The present cameras can capture data such as licence plates but the data belongs to separate agencies which may not actively share surveillance data and analysis. The new camera systems can, for instance, analyse faces - down to race, gender and age - for catching speeding e-scooter riders. Artificial intelligence-based video analytic systems - which allow for facial matching against a database - will enable real-time facial analysis. The sophisticated system can also detect, classify and record objects such as backpacks, personal mobility devices, bicycles, and car models and licence plate numbers. For instance, if a personal mobility device or bicycle is travelling at more than 15kmh on footpaths, which is illegal, the data will be captured and an alert sent to the relevant agency. The speed limit will be reduced to 10kmh next year. According to tender specifications, real-time kinematic technology equipment will also be mounted on the lamp posts to provide line-of-sight connection to driverless cars, to determine their precise locations to help them navigate and avoid collisions. Other sensors to be installed include those measuring temperature and rainfall changes.